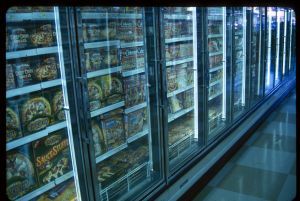 Live For Food » Blog Archive » What lurks in YOUR freezer? I have two freezers. A small upright one, which is a dual unit with my fridge, and a small chest freezer which I keep in my utility room. You would not believe some of the things that are hanging round in the bottom of them. Every now and then I have an industrious fit and decide to clear out all the old items that I am never going to eat, or that are in a really sorry state. And then I decide I’m going to organise the freezer so that I always know whats in it and it wont get in the same state again. The last time I had this clear out, and I did my cupboards at the same time, I have to say I was shocked at the amount of stuff I threw out. I like to think of myself as someone who doesn’t waste food. Whenever those reports come on television about the people who end up throwing out a third of their weekly shop, vegetables that have gone off and so on, I always smugly think, well thats not me. But I think I chucked out two bin bags of stuff from my cupboards and freezer. Among the culprits were things tucked into the cupboards with awkard corners you can’t see round, one of which was a whole packet of biscuits. Other items were say specialist types of sugar or dried fruit or flour that I had bought for a particular recipe but then didn’t use up afterwards. In the freezer there were some very sad lamb chops that were meant to go on the barbecue, but owing to the last couple of summers being terrible they didn’t get used, some mysterious unlabelled brown paste in plastic bags which I thought was black bean sauce at first, but it turned out to be prune puree (a substitute for sugar in low fat cooking), and a tub of a rather dodgy chorizo and mashed potato soup – I have no idea why I kept that as it was horrible the first time round. Since then I have done slightly better at organising my freezer, and it does help me improve my meal planning. The problem with chest freezers is that however organised you start off being, eventually you have a mad rush to put stuff in it, or a wallow in the bottom for something you’ve lost, and by the time you’ve finished its a right mess again and things hide in the bottom unnoticed for the next three years. So what I did was split the chest freezer into compartments. I have the main big compartment taking up about two thirds of the freezer, a shelf which makes a slightly shallower compartment in the other third and a basket that goes on top. The shelf has a plastic divider splitting it from the main compartment. I got hold of a cardboard box, and cut out sheets of cardboard to divide my shallow compartment into two and my main compartment into four. Now my chest freezer has seven compartments, and I keep specific things in each section. I keep fruit and veg in the basket. The two shallow compartments are one for milk and leftovers, and one for frozen foods like fishfingers and oven chips. The four main compartments are for meat, bread products, desserts, and lunch items like cooked meats or quiches. It actually works. Whilst I still dont get round to using absolutely everything up, I am well aware that there is a two year old quiche somewhere in my lunch items section. Definitely an improvement. I haven’t quite got there with the small upright freezer yet. Its roughly arranged by drawer – bits and pieces in one, meat in the next, and vegetables in the bottom one, but I think I have ice cream in the meat drawer and bread in the vegetable drawer. I thought of arranging it by putting items in there that would mean I didn’t have to go into the utility when I wanted something from the freezer, but I kept forgetting to restock it and ended up going out to the utility anyway. So thats a work in progress.